When a TV-master is uploaded to a broadcaster, the in/out time-codes for each video part is specified in the upload templates. This information is used to automatically cut the VoD file for OTT platforms. In order to verify the information uploaded, the time-codes for all parts are listed under the “VideoPart” - tab. The verification is done by the Mediabank coordinator. 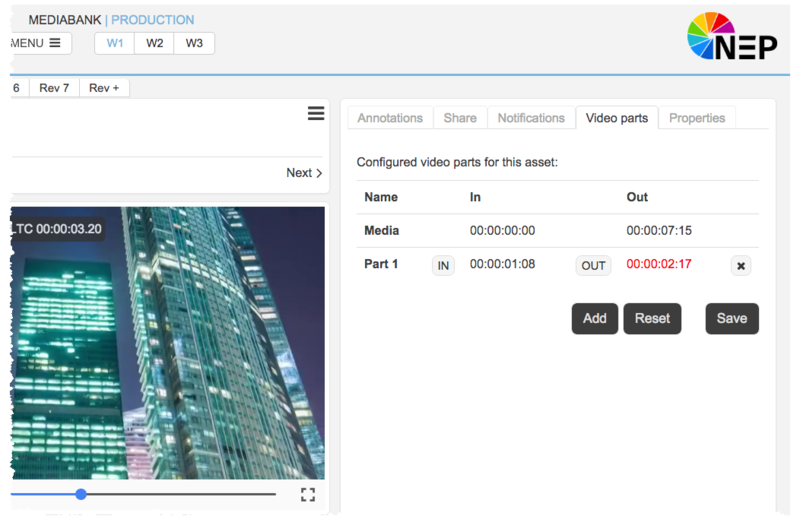 To modify or add video parts you must have administrative rights. End of media: Are calculated from the time codes from the Part 1 to Part #. With additional 10 seconds black frames at the end of media. Total duration of parts HH:MM:SS:FF is the calculated time excluded all pre/post frames. Normally you end your media parts with the last frame 24 (FF) If the Media delivery contains more than one part, then fill in the media start details and the total end of the media including all video parts. Click +Add another for each additional Media part.